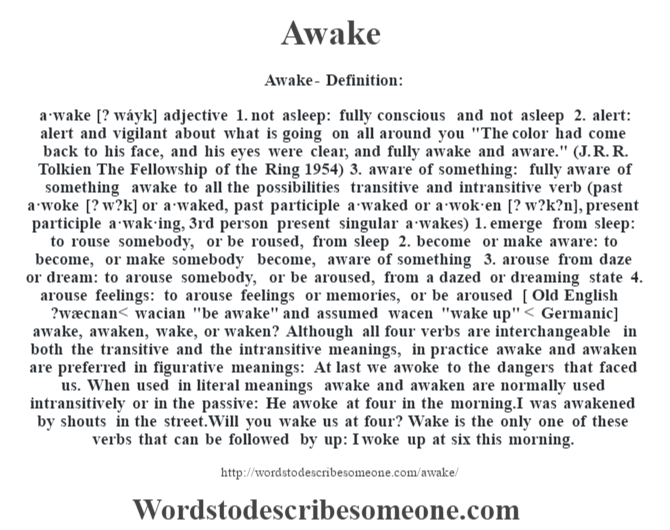 a·wake [? wáyk] adjective 1. not asleep: fully conscious and not asleep 2. alert: alert and vigilant about what is going on all around you “The color had come back to his face, and his eyes were clear, and fully awake and aware.” (J. R. R. Tolkien The Fellowship of the Ring 1954) 3. aware of something: fully aware of something awake to all the possibilities transitive and intransitive verb (past a·woke [? w?k] or a·waked, past participle a·waked or a·wok·en [? w?k?n], present participle a·wak·ing, 3rd person present singular a·wakes) 1. emerge from sleep: to rouse somebody, or be roused, from sleep 2. become or make aware: to become, or make somebody become, aware of something 3. arouse from daze or dream: to arouse somebody, or be aroused, from a dazed or dreaming state 4. arouse feelings: to arouse feelings or memories, or be aroused [ Old English ?wæcnan < wacian "be awake" and assumed wacen "wake up" < Germanic] awake, awaken, wake, or waken? 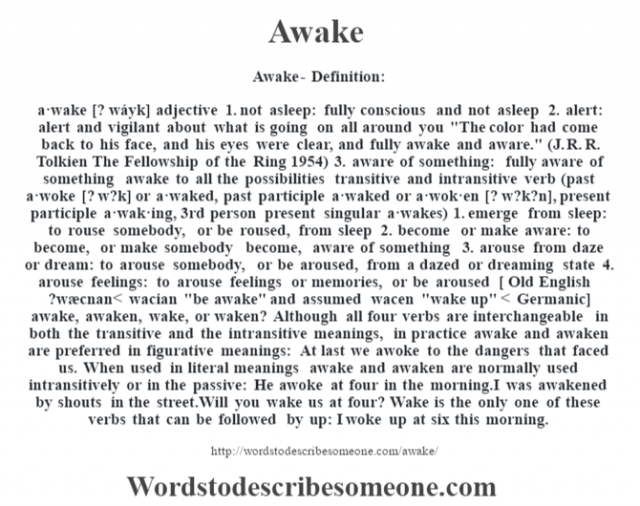 Although all four verbs are interchangeable in both the transitive and the intransitive meanings, in practice awake and awaken are preferred in figurative meanings: At last we awoke to the dangers that faced us. When used in literal meanings awake and awaken are normally used intransitively or in the passive: He awoke at four in the morning.I was awakened by shouts in the street.Will you wake us at four? Wake is the only one of these verbs that can be followed by up: I woke up at six this morning.